The Henry Hoover HVR160 is one of the many vacuum models of the Numatic vacuum range. Henry is one of the UK’s most popular vacuum cleaners, and he is the one that started it all. Henry was born in 1981 as an only child, and there are now over 20 members of the Henry family. There have been many different iterations of Henry over the years, with this particular model replacing the larger Henry HVR200. The HVR160 has been designed to provide all the features of a conventional vacuum cleaner in a compact body with easy access and convenience. 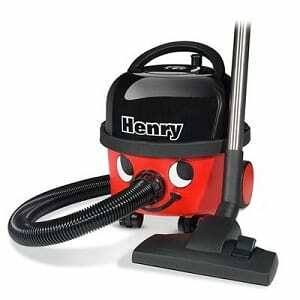 Henry Hoover is a bagged cylinder vacuum cleaner with a large dust capacity and a powerful motor. The sturdiness and performance make him the ideal household vacuum. 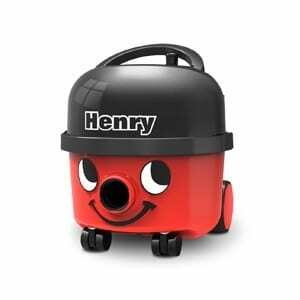 Most British households identify this vacuum as the one with large eyes and a cheeky smile, and Henry has grown to be one of the most trusted names for vacuum cleaners. The Henry Hoover HVR160 has been marketed as an all-rounder. It is has been provided with a professional accessory set to clean almost every surface in a house. Previously, any cleaning requirement involved lugging out a large vacuum and its separate attachments. However, in this model, the accessories, tools and cables are all tucked away neatly into the vacuum itself. A rewind storage system has also been provided for the 10-metre cable. This keeps the long cable trouble-free and spring-free. With every attachment and cable within easy reach, the HVR160 skips the usual fuss caused by corded vacuum cleaners. The 620 watts motor makes Henry one of the most efficient vacuum cleaners in the market. It creates sufficient suction to pick up every kind of visible dirt and debris. It is also rated high on energy efficiency. With a top-class A-rating, the efficient motor is highly dependable. Previous models like the HVR200 are usually provided with two settings for power level. The low setting operates at 600 watts while the high setting delivers 1200 watts. However, the HVR160 surprisingly delivers sufficient suction power at 620 watts. You may not find the need for a higher mode of power due to its efficiency. The filters used in this model are Henry’s own proprietary “HepaFlo” bags. The bags are designed with self-seal tabs which lock all the dust in the bag. This means the dust will not escape out into the house and the surrounding environment. The dust bags can be easily replaced with no mess and spillage. When you purchase an HVR160, you are provided with 3 of these bags (one of which is already installed into the vacuum). One bag holds an average of 4 months of dust, making the replacement necessary only thrice in a year. Another common Henry vacuum feature is the use of the TriTex Filtration System. This innovation not only improves filtration but also the overall capacity of the device. The versatile Henry Hoover HVR160 comes with a range of accessories designed for all types of cleaning. A regular adaptor (otherwise known as the combination floor tool) is what is generally used for most vacuuming purposes. By switching the bristles to face upwards or downwards, the tool can be used on carpets and hard floors alike. The crevice tool, on the other hand, is great for dust in awkward nooks and crannies. These accessories are conveniently stored on-board the vacuum. The three standard nozzles, combination floor tool, crevice tool and upholstery nozzle, are sufficient for every surface in the house. Together, they make the vacuum one of the most versatile cleaners. The HVR160 is built to last. It is more durable and is unlikely to give you any trouble. It has sufficient capacity and is designed to provide five times the capacity of a bagless vacuum. The 10-metre extension cable is long enough to extend the range of your cleaning without having to switch the power source. Typically, the power plug only needs to be changed twice for a three-bedroom, two-floor house. The self-sealing Hepaflo bags are great for disposing of dust with the least amount of spillage. This can be a great feature for those members of the family who may be dust sensitive or allergic. Due to its compact size, weight and convenient onboard storage, Henry is a blessing for small homeowners. He can be easily stowed away and he occupies less space when compared to the usual complex household vacuums. Henry is also great at being versatile. He switches between carpet and hard floors with ease. Further, laminated floors can also be cleaned with no fear of scratches. This is because the floor tool is equipped with a brush that prevents any scratches. Since this is a compact model, those looking for a more powerful vacuum cleaner may be disappointed with the motor. See how it compares to the Dyson Light Ball Multi here. It can also be clumsy to use when compared to the more complex ergonomically designed vacuums. Those used to other types of vacuums (or earlier, larger versions of Henry) may find this model to be jerky and inconvenient. Unlike its bigger version, this model has only one power setting. The “high” energy setting can be desirable to those who must frequently deal with stubborn dirt/debris such as pet hair. Investing in the right vacuum involves a lot of guesswork and unpredictable malfunctions. The Henry HVR160 eliminates most of this confusion. Numatic International has been producing versions of Henry for decades. This makes them one of the reputable brands in the market. The HVR160, like most of its predecessors, can be trusted to last a long time. In my research, I have found this compact model of the Henry Hoover extremely convenient for household vacuuming. Its features make the vacuum easy to use, store and access. Further, it provides all this convenience without compromising on power. The affordable price tag is the proverbial cherry on top. Overall, the HVR160 is a versatile vacuum packed with features and power all wrapped into a convenient compact device.